Latvia’s State Police performed a search in the office of Rīgas satiksme yesterday, 1 October, as part of a criminal process launched in regards to a large scale fraud, as journalists were told by chief of State Police Economic Crime Enforcement Department Pēteris Bauska. He mentioned that a number of procedures have been performed. This includes the search in RS. Authorities have not detained a single RS official or employee. There are also no suspects in this criminal case. Bauska did not provide any more information about the criminal process. He did, however, say that the investigation has nothing to do with this Saturday’s Saeima elections. «Police operations are governed by the law. All activities have been coordinated with the supervising prosecutor,» said Bauska. Police arrived at RS office in Riga, Vestienas Street 35 at 10:00 in the morning this Monday, 1 October. Officers then proceeded to search specific offices, but no documents or other kinds of potential evidence were confiscated. 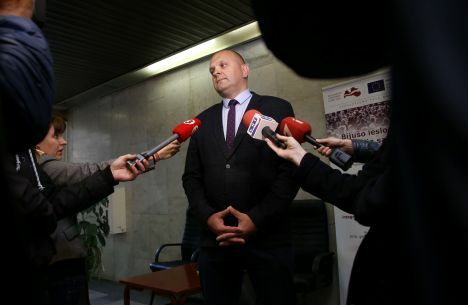 RS representative Baiba Bartaševiča-Feldmane said in the afternoon on the same day that police had already left. She said she is unaware if police had confiscated any items from the company. Mayor of Riga Nils Ušakovs posted a statement on his Twitter account, saying that what happened is most definitely part of a pre-election ploy. «The search happens four days prior to elections and journalists are informed of it faster than the city council. Commenting on anything at this point would be wasteful. I would like to wish SP officers to remain politically neutral,» he wrote. He did erase this entry a few minutes later, and then restored it again shortly after.